A young man in a dinner jacket. 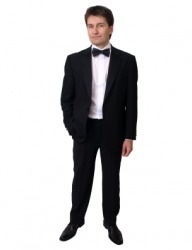 The definition of a dinner jacket is a formal jacket or a tuxedo jacket. An example of a dinner jacket is what a man might wear to a formal affair such as a dinner dance or his wedding. "dinner jacket." YourDictionary, n.d. Web. 13 April 2019. <https://www.yourdictionary.com/dinner-jacket>. (US) A jacket, often white, corresponding to a tuxedo jacket. (UK) What the US terms a tuxedo, nearly always in black.